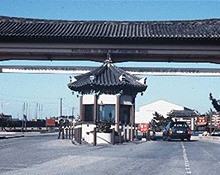 Kunsan AB is located on the western coast of the South Korean peninsula bordered by the yellow sea. It is approximately 150 miles south of Seoul. The base is named after Gunsan City, a port town seven and a half miles east of the installation. Many interesting sites, including temples and historical landmarks are within an easy driving distance.